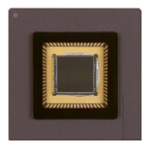 The KAI-1020 Image Sensor is a one megapixel interline CCD with integrated clock drivers and on-chip correlated double sampling. The progressive scan architecture and global electronic shutter provide excellent image quality for full motion video and still image capture. The integrated clock drivers allow for easy integration with CMOS logic timing generators. The sensor features a fast line dump for high-speed sub-window readout and single (30 fps) or dual (48 fps) output operation.